I would just like to say a huge thank you to the manager and the staff who made our evening outstanding and did everything, plus more to ensure we were comfortable and happy in hour 4 hours spent in the restaurant last night. It really did exceed expectations. Thanks again! After 6-8 dinners and uncounted trips to the breakfast buffet, this is my favorite restaurant in town! I have been to Casa Pascal many times for breakfast but this was my first visit for dinner. As it was my 70 th birthday I wanted something special and I was not disappointed , the staff were attentive without being intrusive, the ambience was lovely and welcoming. The food was fine dining but with generous portions, cooked and served to perfection, it was not cheap dining but if you want quality you have to be prepared to pay, having said that it was reasonably priced for an excellent meal and I will return! Kim suggested, and we luckily agreed, a pre-appetizer of the white asparagus for six. Twelve, large luvlies kicked off the evenin in salacious splendor. The oysters, equally, impressed. Smoked salmon – home smoked – on a healthy bed of lamb lettuce outstanding. Cod was very good, but far from a show-stopper. Zurich style veal escalop near perfect Beef tartare one of the best we have had anywhere in the WORLD. Oooweebaby, the wine flowed…five hours later, we were poured into our chariot and whisked away. From A to Z, a must visit when in Pattaya. I just wanted to write to you and say what a good time we had at the PILC Coffee Morning at Casa Pascal last Wednesday. The food was very good and plentiful. Khun Non was extremely helpful and professional as were all of the other staff and chef who attended us on the day. We look forward to another event in the not too distant future. On the more expenisive side of restaurants, but the attentiveness and the food certainly makes up for it. A great experience. I just got home after a wonderful night out with my friend Tom and his wife. They were absolutely delighted with the experience at Casa Pascal. He works as a bar tender (old school – dying breed) at a fairly decent restaurant in the States and his comment was that his boss could learn a ton from you! He doesn’t come to Thailand often, but I am convinced from now on, a dinner at Casa Pascal will always be on his list of things to do when visiting. We turned up just before closing of the lunch service yet they bent over backwards for us. My fussy steak eater friend was even invited to slice a cut of sirloin himself so as not to be disappointed with the thickness. Sorbets, little treats and appetizers were complimentary and Mr. Schnyder personally went to great lengths to make the experience special. This restaurant is a national treasure let alone a local eatery. Well done Sir! One always eats well here. The menu is extensive and there are extra complimentary ‘treats’ served to make the experience more special. The restaurant is very professionally run, with the chef-patron or his wife always on hand to supervise and welcome. They pride themselves on importing the best ingredients (steaks, oysters etc etc) from overseas according to the season. This will appeal to residents of Thailand, who appreciate having such variety – even at a cost – but is not so interesting to visitors, like ourselves, who would rather eat quality local food. Also, I don’t believe – I may be wrong but I don’t think so – there are Thai wines available and this is a great pity, but not uncommon in good restaurants in Thailand. We hesitate to pay expensively for imported Californian or Chilean wine, which we can buy in Europe without the considerable Thai import duties. I should also add that, unless one is disciplined, one eats ‘substantially’ here and one often feels overly-full afterwards. This has often been our experience anyway. But, this is a very good restaurant which we enjoy visiting at least once when we are in Pattaya. I enjoyed a buffet breakfast here. The quality of the food was very good indeed. The decor was pleasantly air conditioned, with good quality furniture. The food was plentiful and any eggs or other dishes that you wanted were cooked freshly for you. Value for money here. Amazing!! Can’t miss if you desire a fine dining while in Thailand. Quality/Price unbeatable. Good wine list, great beef mwat selection. Sometimes disapponting when Lobster not available but alternatives are amazing. Special mention for service: perfectly trained Thai staff which makes a big difference in Thailand ? We first visited Casa Pascal in 2006. 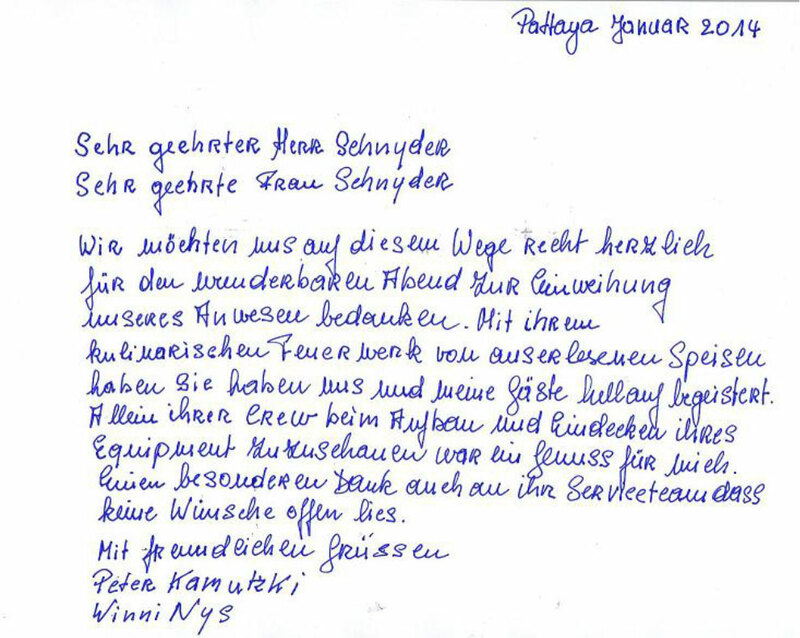 We immediately fell in love with Kim, Pascal’s wife, for her warm, cheerful and helpful personality. Pascal, the culinary genius, is quite simply a perfectionist. Whether the tables, cutlery, glassware (amazing), food, service or wine, Casa Pascal offers a true fine dining experience at the beach. As Pattaya continues unbridled growth in every aspect, including dining options, we always will include Casa Pascal on our list of MUST visit restaurants when in the Pattaya area. From A to Z, a winner!!! Thank you very much for a lovely evening. We all loved the entire evening from your hospitality to décor and the good food. Please do let me know when you are coming to our resort. I wish you and your team a lovely evening ahead of you. In this day & age it is incredibly hard to maintain a high standard in the restaurant business. But year after year, Kim, Pascal & their staff do just that. We eat here on a regular basis when in Pattaya and are always treated as if we are the only diners in the restaurant. As my wife has certain dietary requirements, it is never any bother for them to make a dish that is not on the menu or to change one to suit her needs. It is still nice to be made to feel special and this is one of the few places in Pattaya that still goes out of their way to make you feel that way. Had to try the recommended “Casa Pascal” and must state it is simply great. Nice restaurant interior – tables are in an adequate distance to have a private conversation. Menu list is sumptous – lots of specials that vary weekly – wine list is awesome – the food taste is overwhelming – food presentation is awesome. There is enough staff to post all your wishes in a qick manner. The only downside is a bit of waiting time for most courses of your meal – but still acceptable for a first class restaurant. Wonderful food; wonderful service (the head waiter is quite a character). The best beef we have eaten anywhere (it’s imported from Australia). I have my own beef cattle in Australia, yet have never been able to procure steaks of the quality of those served at Casa Pascal. After a great evening and a number of delicious courses, we were driven back to our hotel in the restaurant’s very comfortable car (and returned the next morning for breakfast, ignoring the free breakfast available to us at our hotel). The best place for me this year. Thanks also to the top staff. Thanks for many excellent dinners this year. Before relocating to Australia six years ago this was one of my favorite restaurants for ten years. I was very interested to see if the exceptional high standard was being maintained. And I was thrilled. Renowned for fine dining at the highest level, including things like sorbet prior to the main course, I was intrigued to find the menu had been extended to cater for a wider range of tastes and prices to accommodate. I chose the fine dinning menu and the goose liver pate was exquisite. The special Canadian lobster mornay including mushrooms (but various choices) was superbly delicious. Priced at 980 baht or about AUD$38, at home a similar dish was recently quoted at $265. Needless to say that cray is still swimming around in the display cabinet! These days I prefer to restrict my contributions to TA for establishments that I find extraordinarily good and I am very pleased to say my experience at Casa Pascal was just that. Even more pleased to report the menu has been extended and should appeal to those of us on a budget but still expect a very high standard all round. A man close by appeared to be in another world as he devoured beef shanks, part of the extended menu. Life is an experience of ups and downs but to survive in such a demanding business for 16 years Pascal and lovely Kim must have the right formula. I am very pleased and proud to highly recommend Casa Pascal. My third visit to Casa Pascal – in summary, all three were a treat you remember for a very long time indeed! On Sunday, 4 December 2016 the service was exceptional from the moment we entered until we left about 3 hours later. Everything, to the smallest detail, was perfect: not only for the guest of honour but all eight of us. The staff excelled themselves, and the many complimentary courses and champagne really knocked us out! In summary, Casa Pascal is not an “every day” restaurant, but if you want a truly memorable meal, this is it! Thank you Pascal, Kim and all your staff. Thank you very much for the detail and attention you provided at Casa Pascal on Thursday 8th December which made the start to my Husbands 65th birthday very special for all of us. Having experienced many enjoyable visits to your restaurant I knew exactly what to expect and wasn’t disappointed. It was my Husband and friends first visit, they were most impressed and will certainly be coming again. Can you please pass on this information to your staff who looked after us really well. Will be visiting again soon. Very nice restaurant nicely laid out, The menu is very good and the food itself was excellent couldn’t ask for better. The service was impeccable the staff very attentive. They pulled out all the stops for my friends 90th birthday and made it a wonderful experience. And a very enjoyable evening. I celebrated my birthday at Casa Pascal on 6 October with my wife. From the moment I made initial contact with the restaurant to the moment we left after a fab dinner everything was first class. We have been to Pattaya many times and we both agree this is the best restaurant for fIne Dinning we have experienced in Pattaya (it also helped that the restaurant was 30m from our hotel : Hotel Barraquda)! We chose the ‘wine and dine’ option. Both the wines and food were of a very high standard and my medium rare steak was cooked to perfection. Both my wife and I left the restaurant at the end of the evening feeling that we had been well looked after by the staff, but also we had eaten a meal that would not be out of place in any capital city in the world. For a birthday treat I was presented with a cake and had my photograph taken with staff as well as being presented with a card, which was a nice touch. It was nice to see the owners on the floor speaking to customers at their tables. We enjoyed our meal so much that we returned twice more to taste the equally good brunch. This runs daily from 8am to 2pm with plenty of food and drink: selection of freshly baked breads and pastries, yoghurt, fresh fruit, hot and cold selections (including a BBQ where the chef will prepare bacon, sausages, chicken breasts, eggs to order), as much tea, coffee and soft drinks as you desire, salads) to name a few items! Again the service was first class and I only hope we visit Pattaya again as we will be heading back to Casa Pascals! A great atmosphere, you will be warmly received by Pascal and his wife. The menu is very rich and delicious. To start we had perch filet and a delicious beef carpaccio with truffles (huge truffles), followed with a beef filet flambé in front of us and a sea bass cooked in salt. They have a very interesting wine selection, mainly French and some Italian food wine. For the quality of food we had and the warm welcoming, the price is reasonable. For all food lovers visiting pattaya, you should not miss this place. One of my highlights to visting Pattaya is having a filling breakfast here. I love the coffee machine and free flow club soda. If you eat low carb high fat you can find plenty of good stuff here. Greetings from InterContinental Pattaya Resort! Last evening myself and my wife had an opportunity to dine at your restaurant and we were impressed with the entire experience from the food, desserts, atmosphere and your associates are your assets. The recommendation they provided us with I was truly impressed. I have shared my experience with my Concierge and am sure our resort will be sending you guests. Sorry that last night I ran out of my business card but took your business card to thank you and your team for such a wonderful evening. PS: Last night I also might one of our guests at the hotel and he was also truly happy with the experience. I used tripadvisor to research a date night for my wife and I to have a date night when in Pattaya. I decided on Casa Pascals after reading the reviews and see the menu. It didn’t disappoint. I emailed to arrange a limo to pick up from hotel and they were quick to reply and informative to my questions. Once we were at the restaurant the service and food was amazing. The only thing that was disappointing is that we couldn’t eat all the main course. They bought out to many samples from the chef. I looked for restaurant for my wife’s birthday dinner around the Pattaya. When I decided here I was refer to the this website. In conclusion, my decided was truly right. They providing warm and skillful service us while a here. And they organized special birthday cake and rose bouquet for my wife. These amazing service was arranged in advance by email. Therefore, we were able to further effectively surprise for my wife. Anyway, it was everything Incredible experience for us. I have been visit to lot of restaurants in Pattaya during 20 years. I make sure that here is one of the best French in Pattaya. If you are Truffle lover. You do not hesitate decide at the here. We ate a Truffle risotto here. We have never been such as great risotto in Thailand. Had another wonderful meal last week at Casa Pascal, consisting of a lovely sirloin, a delicious bottle of wine plus all relevant trimmings. Sorry to miss you and Khun Kim, but your team took good care of me. As I’ve mentioned before, one testament to a well run operation is, when the owner is away the entire process continues to run smoothly – just like a well oiled precision machine! Can you bring back the boiled beef (from August’s menu)? Amazing value (great food, good quality, clean) for money (only 240THB p.p.) for the daily breakfast lunch, I believe from 8am-2pm or so. Great selection of fresh delicious bread, some cold cuts, eggs made to order, cereals, … name it and it’s there, all with fine taste. A number of warm dishes incl. some delicious pasta. This restaurant is beautiful. It’s not typical of restaurants in Pattaya and has a European feel to it. The staff are attentive and professional. We ordered one pepper fillet mignon (which was flambéed at the table, this came with gratin potatoes) and a plain fillet, which came with a choice of potatoes and sauces. I had Bearnaise, which is my favourite and I have had many over the years. This was the very best that I have tasted. Before the meal came, the waiter brought 2 lots of amuse-bouche to the table, which were lovely. Two main courses, 2 gin and tonic and 3 ,vodka and water, came to THB 1,918, this included 10% service charge. We have paid more in restaurants in Pattaya and the quality has not been nearly as high as here. Highly recommended. My wife surprised me by taking me here for my Birthday. Yes we both enjoyed our meal in lovely surroundings. Surprise Happy Birthday dish at the end Thank You Kim and Pascal. Watching it rain outside. We got Casa Pascal transport to take us home. I have had their Buffet breakfast many times lately. Which is excellent, plenty of choice, many different breads, cold or cooked food. Good value for money. I believe it’s the best fine dining restaurant in Pattaya, we went to had lunch twice within a week from Rayong that required one hour travel distance. Thier foods and services are perfect! I will be there again if there is a chance. Solid breakfast buffet! 241 Baht will get you juices, 4 to 6 loaves of bread, croissants, continental breakfast pastries, soups, salads, noodle dishes and grilled meats and omelette bar. Waffles and pancakes are on order and coffee machine makes 6 different types of coffee. price wise a great value since you will end up paying that much for all these items separately, elsewhere. I have been to Pattaya over 11 times. Casa Pascal is without a real gem. Walking distance from Soi 10 where I was staying it is without doubt one of the best restaurants I have ever been too, ANYWHERE !! The menu, service, atmosphere is 1st class. A group of 7 of us had 2-3 courses + drinks. All that attended could not believe how good this place was, some of the best meals some have ever had ? Pricing is very reasonable, be double the price or more in Australia. A must visit. We found this restaurant for pure lucky during our trip in motorbike. Appetizer,starter and Main dish was everything incredibly perfect, with high quality and a wonderful presentation. Any other raw material from the respective countries , in order to find the highest possible quality in every dish. One of the most finest restaurant in pattaya. Very good price for the quality that you ll find. All of our friends felt in love with both gastronome and warm welcome from your staffs. Good, quiet location. Clean and the Service is excellent. I have been many times here and the dishes was always very good. Don’t like Bangkok, you can only found roadside cafe or chain shop restaurants in down town Pattaya. Finding Casa Pascal is a great discovery to me this time. It’s just opposite to Marriott Resort. Actually I didn’t have much confidence about it, so I just tried the brunch there. The brunch is THB240 but from the food, the services it all made me make another reservation for next day dinner. At night, the restaurant transformed to a fine and romantic restaurant, very good impression. Choices from the menu is not much but my 6 family member all satisfied from the soup, the starter to the main course. What I can tell you is you should go and find out yourself. It suitable for a dating couples and a easy family gathering. Highly recommend. Of course dinner bill is much different with brunch but it’s good value to dine in thailand. I ordered onion soup, spag bol and a desert. The garlic bread is probably the best ive tasted. I was stuffed but still managed to eat it. We received home made bread with butter and cheese, a cucumber soup, a pasta taster and a sorbet all gratis. I never thought id like cold cucumber soup but all of it excellent. Only problem was I felt like the fat man from the monty Python sketch! I go eat manny time dear ,great variety of food,exellent!Service is verry good, Thanks on the Owners Pascal and Kim, and not verget working people, good job! So glad we tried this restaurant . It was everything the reviews said and more ! Around $95 but worth every cent . It wasn’t too expensive considering we had garlic shrimp, fried goose liver , ravioli , Weiner schnitzel the size of the whole plate, two tiger beers, one margarita , one Singapore sling , loads of fresh baked bread, complimentary goose pate, corn fritters and sorbet . So worth every cent , it was all the fuss of fine dining without the expense. Loved it and will definitely go back again and again , can’t wait. Have been here a few time, it is compulsory if I am in Pattaya, no matter with friends or solo. It serves the BEST beef steak tartare in Thailand, hand down (and I have tried dozens and dozens of versions in Thailand). I decided to dispense with a main course and instead have a whole slate of starters – the right decision, totally. The garlic prawns were yummy, the lobster bisque was well made, the carpaccio was just right….but the beef steak tartare was PERFECT. Made at the table, of course. I do remember once talking to the proprietor about how different grades of Wagyu lend themselves to tartare (it is NOT that the highest grade makes the best tartare…). Seemingly, Pascal Schnyder is extremely serious about his tartare – ten out of ten Pascal! Nothing beats going crazy on his starters, culminating in beef steak tartare, with a bottle of bubbles on the side. Perfect! Amazing! Like in Michelin restaurants)) meat was perfect! Good wine list. Waiters are kind and responsive. Thanks Casa pascal ? We had an excellent dining experience at Casa Pascal. In my view, it is the combination of excellent food – creatively prepared and served with well selected wines, the highly trained and skilled staff, and the relaxed atmosphere that makes Casa Pascal to a real insider tip. I am a long time expatriate in Pattaya and Casa Pascal is in my opinion clearly one of the best dining restaurant in town. It is a real oasis in the middle of a buoyant city. I cannot tell you how enjoyable an evening I had at your restaurant. From the start with name card on the table to outstanding food and service! Not to mention the finishing up with the crepe suzettes which were prepared almost as good as I make! (that’s a joke). J And then at the end of the night the limo back to the hotel in the pouring rain put a beautiful conclusion to the evening. I know I will be back in Pattaya probably the 3rd or 4th weekend in August and you most definitely will see me there again. This time I will reserve a smoking table! I will be more than happy to relay my comments on TripAdvisor. This way more people can enjoy the experience that I had! B. P. ………………….see you in August! First time dining at this restaurant after reading positive reviews at tripadvisor . Peaceful ambience , attentive service and delicious food. I had John Dory as the main course and it was made to perfect . 10 out of 10. Very soft and tasty fish . My daughter had mushroom risotto which was very tasty too . We loved the crepe suzette . Thanks to the service team for bringing us a memorable evening with good food and surprises. We went back the next day for brunch which was great value for the price paid . A highly recommended fine dining restaurant in Pattaya. Swiss ran upscale restaurant opposite the Marriott on Second Rd. Excellent brunch served til 2pm that offers eggs and waffles to order, grilled meats, soups, cold cuts, home baked breads, desserts, coffee and soft drinks…all for 220 baht…Good service and European atmosphers and cleanliness. Dinner is also excellent, but more pricey. Impeccable quality. Ok I keep trying to find another graat place for breakfast other than casa pascal nut each time I do I get disappointed. This place has incredible food highest quality ingredients and lovely staff. Thiscoffee is wonderful especially for a buffet. It is clear the owner cares about his product and I vow not to waste any more time or money looking elsewhere for breakfast.plus the ambiance is very good. Well done and thank you for filling the great breakfast void in pattaya! Dined at several locations in the city. Some good/some bad. Casa Pascal is absolutely the real deal. Beautiful place, centrally located, and an incredible european style menu. Where else are you going to find Canadian lobster, Wagyu rib eye, proper goose liver pate, and a large serving of beef carpaccio for an appetizer? Between us the meal cost about 3400baht, which for locals is pricey…but for high end international cuisine, it’s about 50% of what we pay in Washington D.C. Great service, amuse bouche, pallet cleansers between servings, and really well made cocktails. It’s our new favorite place in Pattaya. BTW, the rack of lamb was absolutely perfect, as were the butter garlic scallop starters. I mean, holy cow, the food was sooooooo good. Classy, but casual. If you are on a budget, there are several mains that are very reasonable, and tasty! We are checking out the breakfast buffet in the a.m. will update then. After a bit of a night out in Pattaya, this is the perfect hang over breakfast place. The price is good ( 249. bht ). You get a nice selection of fish, salads, ham, egg, sausages, sweets, too much to name everything, but i was mostly impressed with the selection of different breads. DELICIOUS. Seriously best breakfast ever. Had dinner at Casa Pascal on Saturday evening in early May. Excellent venue just off 2nd Road. Pattaya isn’t known for it’s fine cuisine, most holidaymakers are on budget trips or tours. I looked at this restaurant on TripAdvisor and it was number 7 in Pattaya. After dining here I feel it should be in top 3. Unfortunately the ranking system isn’t just about the best food but takes in price location etc so sometimes put’s a great restaurant further down the list. We arrived fairly early evening but as we left it was filling up. Clientele looked like mostly Western ex-pats with a few holiday makers. I’m guessing it’s restaurant of choice for many people living in Pattaya. There was an excellent wine inclusive menu well priced as well as a la carte and a non wine set menu. Courses were served with complimentary dishes between such as sorbets , meatball, etc. The staff were very attentive and polite and ambience was excellent. Great find for myself who likes to dine well. This place is quite the value for money deal maker. The Breakfast Buffet spread is massive. You cannot possibly have it all. The steak choices are very good. Its not surprising considering the popularity of this place amongst locals and expats alike. Much better than having an ordinary meal at your hotels. Do not go for the breakfast instead come over here, it will be worth your time and effort spent. The restaurant is located in the middle of the busy city centre of Pattaya. As soon as you step in you feel you are in another place and even contitent. The service team is superb and especially Khun Noi who prepare the Tartar on a gueridon right in front of our table was well trained and knew what she is doing. Special services as the tartar and the Crèpe Suzzette who will be prepared and flambéd next to your table are outstanding and nowadays barely to find. Two Amuse Bouche and a Sorbet as a classic pre-dish before the main course and the tase and quality of the ingredients of all dishes are delicious. Thank you Casa Pascal for giving us this bless of an evening in the middle of dirty Pattaya! I joined the Wine & Dine Gourmet set Menu with my girlfriend for our (double) birthday occasion. Everything was perfect – sparkling bubbles, excellent wines and a creative prepared dinner – a truly experience for all senses! Last but not least the staff and management surprised us with a lovely birtday cake with candels and they sang “Happy Birthday” for us! At all the staff at Casa Pascal is perfectly trained and very obliging. The atmosphere in the restaurant is nice, a perfect place to spend with your wife or girlfriend for a culinary evening in fine dining style. Great service, refined quality, nice atmosphere. Attentive staff. Easy to find, good parking facilities . Owner is a very nice host that obviously has been around. This fine dining restaurant is outstanding in every aspect from service to food. Very delicious salads, appetizers, and entrees served by a most attentive staff. They feature a very complete wine list to complement your dining experience. Thank you for excellent food and wine at my 60 years birthday celebration last night. The party was a great success, and the guests were extremely happy with everything, not least the Gewürztraminer, which was really first class. Those guests are my best and closest friends in Thailand, all of them the kind of people who I can always trust, whatever the situation is. What can I say..very good and fresh food, very helpful and nice staff, a nice atmosphere and vey good prices…all you need to complete your holidays. The owners are also very friendly, all the time in their restaurant and it is hard to believe what other people write. If the Casa Pascal would be like I have to read in other postings they couldnt be so successful. The owners are the same since many years. I am happy to know that place in Pattaya, all my friends like that great restaurant too. I was visiting Casa Pascal 3 times for dinner in the easter and each visit was a great experience. The restauarnt has a very nice athmosphare and you always feel welcome when the employees welcome you when arriving. They have a great menu with a lot of different choices and it’s also a lot to choose in the wine menu. The employees are friendly and profesional, and it is an unformal athmosphare in the restaurant. I’m coming back to Casda Pascal next time I’m in Pattaya and I recommend Casa Pascsal for all of my friends. I’m coming back next year. We stumbled accross this restaurant and are so glad we did, the food is exceptional, service fabulous and would highly reccomend this restauant as one of the best in Pattaya. We went two nights on the run and if we had ben staying longer would have gone again, the quality of the food couldnt be beaton and the staff were all so lovely. we will be back. This is a type of fine dining restaurant, which serve western and Thai food. The restaurant is clean, good selection of food. Their Thai food is the best I ever taste in town. I can noy believe this place is only rated No7 on trip advisor. Everything about this place was spectacular. Started from the moment we walked in w a warm welcome & given a little area that felt like out own. The cocktails were the best I’d had the whole trip, the food was just devine not to mention all the little extras for cleaning the pallet b4 & inbetween our meals. We went here to celebrate my friends 30th & they brought her out a special dessert & all staff came out & sang happy birthday to her…….. Not a single thing cld be faulted. Thank u for a special night out in Pattaya on Monday 22nd Feb.
We had the daily special. Been to this restaurant a couple of times lately and had very pleasant dinners. Lobster salad was delicious as were the oysters. Good service and the owner very attentive. We sent to celebrate à friends birthday it was my first visit to Casa Pascal and what an ewening it became. The food was the best in years. And the staff what lovely people, the service was top of the top. Everything was of high quality and when we coming back in november it will be à new visit. Nice seating indoors and out. For Lunch – Selection included a pasta, soups, fresh fruit, various breads and veggies as an all you can eat buffet. Drinks were included – fruit juices, tea or water. Very clean and comfy atmosphere. Came here in August, really enjoyed it. Enjoyed the 990 set menu, 4 course meal which included 7 dishes – very happy, very recommend. I enjoyed being introduced to the pet lobster who I’ve named Gary, dear Gary – I will never eat you but I thoroughly enjoy your meet & greet role you have at the restaurant. It got to the point where I bring friends just to see you. Point being, may the odds be forever in your favor. Having previously read other peoples comments on Casa Pascal. I really wanted to try this place out for myself. The food was cooked to perfection, the flavours were great and the service was great (although as the night went on a few of the waiting staff lacked direction). The complimentary tasters between courses were great and complemented the meal well resetting your tastebuds ready for your next course. Definitely one of the best restaurants in Pattaya. The restaurant is highly rated on tripadvisor, but the actual experience was surpisingly good. The restaurant is quite large, with about 15 (?) tables, interspersed with pillars, so the whole feel is roomy and away from other tables. The food was first class… no complaints about anything … fois gras starter, wagyu steak for main… all perfectly cooked and perfectly swerved. There were tasty amuse bouche between all the courses….. and maybe this was the key to why it was such a good evening… the tempio that the main food arrived left plenty of room for chatting, so the whole meal lasted about 1 1/2 to 2 hours… which made it a really nice evening. I have been to too gher “gourmet’ restaurants in Pattaya/Jomtiem where the service was so fast that, with the high prices, it was like watching a london taxi meter ticking over in a traffic jam….. about 40 minutes, 4000 baht ($130) and out! So full marks to Casa Pascal for such well judged timing. Hard to fault. The menu is full of imaginative dishes, full cocktail list and the service is excellent. Quite expensive compared to other first class restaurants but well worth a visit. We had booked New Years Eve dinner here a six course excellent meal although we did have to ask the to slow down a bit between courses. The food was all fresh the staff are always happy to see you and greet you with a smile. . We ate there a number of times not the cheapest place in town but one of the best. The wine list is extensive but beware in Thailand wine is very expensive and can add up to half of your bill. The lamb is beautiful I had it on three occasions the duck for appetiser or mains is amazing. There is a choice of vegetables I had the spinach but one thing please take the stalks off. Potatoes done in so many ways all I had were beautiful well seasoned ,there is also rice, The other bonus is that Casa Pascal do breakfast all you can eat for bht240, this includes Thai, Continental and American the choice is out of this world and cheaper than most hotels eat in or out and all drinks are included. Some people seem to fill themselves up for the day with piles of fruit and food all at the same price. Consistently excellent service and good quality food make this our first restaurant stop every time we visit Pattaya. We try other ‘upscale’ places, but always come back to Casa Pascale for its relaxing atmosphere and good value dining experience. The set menu is particularly good value, but seasonal specials are always worth a try. This place is superlative. I enjoyed a fantastic lobster bisque and a yellowfin tuna steak while Missus fell in love with the tuna carpaccio & lobster thermidor. The staff is flawless. We enjoyed the time at Casa Pascal tremendously. This time my girlfriend was with me and we took our time over 3 hours having a fantastic meal. Many mouth watering options, but the lobster was fantastic and I’ve no idea how the lamb rack was so tender…the best I’ve ever had. Will be back soon for sure. Absolute perfection, service as well as food and wine. The best Sirloin I have had in a very long time, cooked to perfection. This restaurant has fantastic service, beautiful food and a lovely escape from the busy Pattaya streets. We’ve been there with my wife and a good friend. What should I say, it was excellent. Very friendly owner and service. We really like to comeback i’ve we visit pattaya again. We came for the Christmas Dinner as usual, but this time we were beaten by the number of courses and the quality and quantity of the food. Next year we will have to cut down on the eating! But each year, Casa Pascal and his team manage to cook and serve the highest possible. Of excellent food – truly a five star performance. We are used to visit Casa Pascal while in Pattaya. This restaurant keep up its reputation and standards as a fine dining destination. The owner is Swiss and produce excellent dishes from all around Europe. There are dishes from Thailand too, in case you are with some locals. Merry Christmas and happy new year from me to all at Pascal restaurant. For me you are the best restaurant in Pattaya. See you for Christmas dinner 24th December. For my 12 days in Pattaya, i hade lunch 5 times (own review) and dinner 2 times at Casa Pascal. Casa Pascal is without a doubt my No #1 place to have dinner in Pattaya. Everything was just the way i like it. I will be back next time i am in Pattaya. this is excellent dineing little upmarket .but worth it to say you have been here .food is excellent service excellent .could not fault it .they do great breakfast also . We loved the food and it was reasonably priced. Great selection of wines. The food quality and service is comparable to a 3 star in London. Brilliant! We often visit Casa Pascal when in Pattaya. This restaurant offer excellent food, good atmosphere with friendly service. Our last visit was fine, the food was well presented and cooked properly, a thumb up for my beef fillet steak. Good selection of wines a la carte, interesting the Italian region. I recommended for a pleasant evening having excellent food and quality service. We had been recommended by friends last year and finally made it. Made a booking for lunch and when we arrived the table was beautifully set ready for us. The service was excellent throughout our 2 hr lunch. My wife started with lobster bisque laced with cognac and I started with half Canadian lobster salad, both superb. We were offered, compliments of the chef, a pork delicacy, a taste of fried dory and a palate cleansing sorbet, all perfect. For mains my wife had scallops with garlic and I had steak tartare, prepared at the table, so tasty. The house wines were very acceptable and whilst not inexpensive by Pattaya standards, it really is up there for fine dining. The decor and layout was very good, the service and ambience excellent, and the food is simply first class. I have never felt compelled enough to submit a review before, but I truly highly recommend this restaurant. Any visitor to Pattaya should ensure they visit this establishment, you won’t be disappointed! You can probably find a cheaper buffet but the quality here is very good! 6 or 7 fresh breads to choose from, eggs done to your liking, potato salad as well as shredded fried potatoes. I choose not to ask for clarification on whether the things that looked vegetarian truly were, but if I was right there is decent amount of vegetarian options. There is also coffee and juice included. Very reasonable at 24 baht considering that at another popular place I paid 230 for a small English breakfast (meat removed) and a coffee with no refills. Here you get as much coffee as you want as well as a couple dessert options. There is also a bbq available with meat grilled to order if you are a meat eater. Breakfast is served until 2 which is great because I was staying a little far away so it always took a while to make my way there. The atmosphere in the restaurant is fine and you feel welcome from the minute you are inside and the staff is welcoming you. The menu is very good and they have a lot of good, different wines to choose. The prices in the restaurant is quite low compared to what I have seen in other places and you will get much for the money. I had 3 visits in the restaurant together with a friend of mine, and we loved the meal and atmosphere from the first minute we were there. The staff was friendy, service minded and very professional. 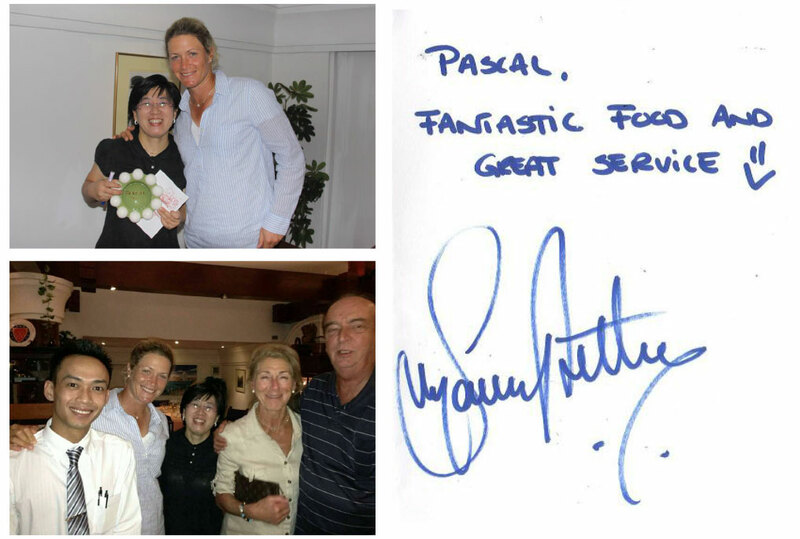 I´m really impressed over Casa Pascal and I have been in a lot of good restaurants in different countries. Their lobster meal was just fantastic and I will recommend you to try it when you are visiting them. I´m coming back to them next time I´m there. I love this place. Enjoyed a lovely dinner for two. The main course was Venison Escallops in Mushroom Sauce. It was just the right place to enjoy our special occasion. If you are not into Venison Escallop there are other delicious menus to choose from. Make sure you have a big appetite before you go to this place. I’ve been 3 times now and the standard is always great. Great choice too. If you are an expat in Pattaya and you miss your bread this is the place to go. There is every type of bread you could want and all fresh from the oven, one of the only places to get really good croissants. The coffee is excellent and the mugs are really good size if you like a lot of coffee, see the picture of hippo mug and that is full size tea spoon next to mug. The breakfast food is really very good with great selection of all types. I highly recommend having a brunch at this restaurant, food is very good and plenty if you are a big eater and very reasonable priced. I always stay at a Hotel near Casa Pascal’s so it is an obvious place for me to have breakfast. They provide an excellent eat as much as you can buffet breakfast and I can only quote what one other customer said ” it is the best breakfast in town”. A comment I thoroughly agree with. Long may it continue. There are lots of places to eat in Pattaya, covering the spectrum from street food, to cafes, fast food junk, hotels and anything else you might want. However, this place is a rare gem with beautifully prepared dishes from a menu that has obviously been prepared by a chef who knows what he or she is doing. The menu is definitely International in style with influences drawn from across the globe. Much of the product is sourced from where the best comes from; Beef from Australia, lamb from New Zealand, local seafood etc. The decor and ambiance is Euro rather than Thai and this suits the experience. This restaurant can sit comfortably with anywhere else I have eaten in the world. The price is very reasonable for the quality. $235 Australian dollars for 2 courses for 2 people, including wine which is the expensive item in Thailand. Last year we paid about $650 for the same type of meal at Sirocco at Lebua in Bangkok. Casa Pascal was better value. I will definitely dine here again when in Pattaya next year. When you want to get away from the hustle and bustle of Pattaya, relax in sedate surroundings, feel pampered and have a great meal, then there is no better place than Casa Pascal. This fine dining restaurant still ranks up there with the best and the food & service cannot be faulted. Pascal, Kim & the staff go out of their way to make you feel special and will always try to meet your dietary requirements by making something that is not on the menu. From the rack of lamb, tender eye fillet to the crepe suzettes everything is just perfect. We were in Pattaya again for 3 weeks last month and ate there a further 3 times. We always try to eat different things off of the menu and I must say we were not disappointed on any of the 3 occasions. Besides the meal that you order you also have receive 2 servings of Amuse Buoche (single bite helpings of Hor’s D’oeuvre), water ice to cleanse the pallet and a continuous supply of fresh bread with dip & butter. Also, unlike most restaurants in Pattaya, all diners at the table are served their meals at the same time so that nobody has to wait for their food, Upon seating a stool is placed next to the female guest for her to place her handbag. So,a little bit of class in a city that never seems to sleep. Casa Pascal has definately the best value brunch buffet in Pattaya. Nice calm atmosphere. Friendly staff. Lots of bread, croissants, omelets, juices, coffee, tea, sodas. Eat and drink as much as you like. Great value at only 225 Baht! This restaurant gives you a taste of French cooking in Thailand. those who do like to experiment with the palate will find the menu quite interesting including the amuse bouche and the quirky desserts. slightly on the expensive side but well worth it. incidentally i had good red wine here. Celebrated my grandfathers birthday in May with family. Fantastic food, drinks and service. I had a five course dinner with meat for main course and I have a feeling that they really care and are passionate for the ingredients they use and the food they make. Dear Pascal, Kim and all the long time serving Staff of Casa Pascal; I would really like to express my gratitude and thanks to the whole Casa Team here in Pattaya. You have managed to stay at the top of the culinary scene here in Pattaya for so many years now, that i have decided to post a review on Tripadviser. How do you do it..? I have been coming to Casa Pascal now for 10 Years + and you have been able not only to maintain the already high standard throughout, but also improve like an aging Bordeaux over the years. The selection of dishes has kept pace with culinary trends and the quality ingredients used speak for themselves, which is rare for a restaurant in Pattaya. Your’e fish comes from a sustainable source and all import products are of the highest quality justifying the price; in some cases cheaper than in Europe..! The warm greeting and friendly goodbye make you feel like you just had diner at home. I wish Pattaya had more restaurants like Casa. See you all again in September this year ? Was here with a friend for brunch. She ordered risotto and I had the breakfast buffet. Smoked salmon was on par with Norwegian standards (slightly bony but very tasty). The risotto was huge, buttery, with fresh shrimp. I’m sure this is an expat staple and I will be here again for dinner when I am back! The waiters even gave some complimentary appetizers while we were waiting. Awesome! Casa Pascal’s is considered one of the best restaurants in Pattaya. The atmosphere, service and food are all top end which is reflected in their high prices for dinner. However, they offer one of the best breakfast buffets in Pattaya at a very reasonable fixed price; freshly cooked croissants & breads, unlimited flow of juice, soft drinks, coffee, eggs, waffles, pancakes cooked to order, ham, bacon, chicken, sausage, pork sides, cereals, yogurt, steamer hot dishes and desserts. Daily 08:00 until 14:00. European food is great – the choice is a bit eclectic but there’s always something on the menu with some interesting imported ingredients; we had white asparagus from Germany (haven’t had that since 2002). The fish is excellent and the portions are large. The staff is friendly, attentive and professional. A night out in this place doesn’t come cheap; but you really do get what you pay for. Book now! There’s really no reason not to visit Casa Pascal. Called restaurant to see if they could accommodate 12 golfers and we were there within 20 minutes with a beautiful table set and waiting for us. Great food and very attentive and professional service. A good wine list and at reasonable prices for Thailand. All 12 of us enjoyed our meals as well as the amuse bouches provided. We had dinner at Casa Pascal with 6 friends. It was such a great dining experience in Pattaya that nobody expected. Excellent presentation and very tasty food. Service staff were very efficient and provide cordial service with friendliness at cozy romantic atmosphere. Tables were nicely set-up with quality tablewares and one of the best part of this restaurant was the most beautiful restroom in whole city. Compare to the quality of food and service, the price is very reasonable. We had such a wonderful time and highly recommend this restaurant as must visit place in Pattaya. Bravo! Casa Pascal and keep it up. We will definately come back. Twelve of us dined there this week. Best food we have ever had in Pattaya . We should have found it earlier. Food excellent ,Service excellent . Wine excellent and reasonably priced . I am not an expert in Pattaya restaurants, but Casa Pascal comes in the top league. We ordered 1/2 Canadian lobster cocktail, German asparagus, Alaska scallops, Dover sole with Belgian sprouts all moisturized with an Italian Pinot griglio. Service was superb as one would except from a 5* restaurant. Our little one of 4 years behaved for once, surprisingly tried all of the food presented to her and was the coceluche of the staff. Bill came to 4400THB for the 3 of us, although the little one’s bill should be limited to her coke zero. This restaurant is amazing; great atmosphere, wonderful staff and the most amazing food. The menu is amazing and the lobster (a personal favourite) is some of the best I’ve ever eaten. The staff are so helpful and amazing that they make this restaurant a 5* experience. I cannot wait until I get the opportunity to make another visit. Recently visited Casa Pascal with friends. The restaurant is contemporary and the staff welcomed us with a warm welcome. The details of this restaurant are from a five stars hotel, in fact, after investigating I discover the owner has 5 stars hotel background. The menu is huge, so we asked the manager to give us the best dishes in the house; Beef carpaccio, terrine and beef fillet just to name few. Terrific presentation and gastronomic flavors for this tasteful kitchen. I really liked this restaurant, While we were waiting for our food the waitstaff came out with tastings and they were really good about taking care of our 6 year old. The plating was quite generous. I came back the next morning for breakfast, the bacon was not as crispy as I would like, but I could have sent it back, it was a mix of canadian and smoked bacon. It is a lovely atmosphere. was the best I test for long time. It was my wife birthday, so I informed Casa Pascal of the special occasion. We got picked up by the hotel by their car and escorted in the restaurant. Beautifully decorated inside a road away from the traffic of Pattaya, we knew immediately were going for a special evening. The menu is European, with a wide range of French, Swiss and Italian dishes. We had a bottle of Amarone, that my wife love so much with a pair of beef steaks. We have a perfect evening in this beautifull Restaurant with a perfect service and very special food. The best Restaurant in Pattaya for us, we come back soon! Had breakfast there twice last trip and have absolutely no complaints. Very pleasant setting with inside and outside seating options. There is the usual spread of breakfast favourites with the added bonus of freshly cooked dishes off the BBQ. Coupled with quite decent coffee, I think this is one of the best “all you can eat” breakfast options in Pattaya. Will certainly return next trip. Went here with my girlfriend for our anniversary. Literally the best dinner I’ve had in the city. Surpassed the hype. If you haven’t been here, you’re missing out. Of Booking to the addition through the service, surprises and compliments, the quality and presentation of the dishes, everything was perfect ! Leuk gelegen, prettige bediening, betaalbare prijzen maakt Casa Pascal tot één van de betere restaurants in Pattaya. Beter dan vele andere schreeuwerige gelegenheden in de omgeving. Zelfs beter als vele restaurants met een hogere reputatie. Een heerlijke mouton cadet begeleide onze carpaccio en australische angus beef. Precies goed gebakken. Een minpuntje aan het eins was de opmerking over een pousse café: de politie in Pattaya controleert NIET op alcohol. Een slechte aanrader….. Nog een opvallend element; de ruimte tussen de tafels, je voelt je echt privé. It is a quite fancy restaurant of very high standards in Pattaya. Its Chef is a famous one and has a great proir experience over the world. I have been in the restaurant several times, being extremely satisfied all the times. The cousine has Thai components as well, but still it is mostly European cousine of the highest quality, The dishes are quite tasty, and some of them also means a show part like the seabass baked in the salt cast. I would recommend to try it it you are the first time here and have doubts what to take. I also recommend the smoked salmon as the starter, it is delicious. It will be unfair not to mentione the row of compliments which are usually supplement your own choice. All of them that I tried were very tasty. And I should mention as well that all the staff is very friendly and helpfull. The only drawback of the place is the price, which is somewhat higher than in other places in Pattaya. But sure it is justified by the quilty of the dishes and the service. I will certainly visit it again and recommend it to everyone as probably the best restaurant in Pattay, and surely one of the best. I can only recommend Pascal breakfast buffet for the small price. On a good level of quality. Well done Pascal keep it up. I ate again at Casa Pascal after a bit of time away from Thailand. It was thoroughly enjoyable as usual. The service is always first class and the food magic. I did try the home smoked salmon and wow what an absolute delight. I have always been very keen on smoked salmon and was tempted when the menu said Pascal smoked it himself in his back yard. Wow the best I have ever had. A lovely restaurant and reasonably priced. Just the place for an excellent lunch or dinner. Nice owner who are very attentive and excellent staff. Amazing variety of food an regular special offers. We went for Christmas Day. The courses were delicious, presented in an attractive way as well. The staff were friendly and attentive. This is one of the best restaurants in Pattaya by a mile. I would definitely try it.mthe prices were very reasonable for the quality you get. I am looking forward to trying their usual menu. What a great find this turned out to be. We were looking for somewhere to have a good sit down Christmas lunch. Having looked at recommendations on trip advisor we decided on this one. The restaurant is lovely, the service was great and the food was really good. We chose the free flow option and it truly was. I will definitely go back next time we stay in Pattaya. I just wanted to say thank-you for the delicious turkeys, my family had flown in from England so I was anxious that all went well. Superbly cooked, piping hot – still when we got around to lunch after the champagne! Spot on delivery time. I have recommended you to a number of my friends for next year and may I take the opportunity to wish you and your team a very happy and prosperous New Year. We went for the Christmas lunch set meal and were not disappointed. The service was excellent and the food was equally so. Each course was tasty, from the lovely appetizer platter to the roast turkey. We didn’t think we would like the pumpkin soup, but it was surprisingly good. We barely had room for the dessert by the time it came. It was a great deal for 990 THB. Only drawback was that we had to sit on the patio with some smokers because we came at the end of the lunch service. Would definitely recommend for people looking for good western food with excellent Thai service. We Casa Pascal Xmas day for the set meal, with choices for the main and desert. I am now generally excited by visiting places that are packed out and also under a lot of pressure for events like Xmas dinner, but I must say the total experience was excellent. It exceeded expectations. We were a party of 8 and had a round table in an alcove which made it feel private and enhanced the atmosphere. The food was good, presentation excellent and service first class. Wine can be a pretty expensive but found good NZ reds/whites which didn’t break the bank and were most enjoyable. They provided a car pick up and drop off service which was a nice touch. All our party had very positive comments and we will determinately make a return visit. We were lucky enough to to have Christmas lunch at Casa Pascal this year. The waiting staff were very attentive and the restaurant had been tastefully laid out with printed Xmas menus and little name cards. The food was fabulous with 6 courses and very traditional flavours and ingredients. Would highly recommend this place as one of very few fine dining places in Pattaya whilst still being reasonably priced. Our friends let us down and didn’t arrive for the lunch but the owner was non-plused by this and was happy to move us to a small table without any fuss. Thank you for a lovely Christmas day Casa Pascal! Wednesday 24th December i had one of the best meals in a long time. This Christmas Eve had Pascal Restaurant an absolutely delicious menu with top food. We got 8 different ones tapas / pumpkin soup / green asparagus with hollandaise / excellent turkey and a lovely Christmas pudding. The restaurant was completely full of guests both inside and outside. A wonderful job by everyone at kitchen and waiters made the evening absolutely top. I’ve been to Casa Pascal many times for their great brunch, but this time my wife’s sister, her husband and us went for their Christmas Eve six course dinner, which at 1290 baht (US$40) was spectacular!! Elegantly presented and well served meal started with an amuse bouche, then a cold cucumber soup, excellent array of cold cuts appetizer, a great pumpkin soup, passion fruit sorbet, choice of four entrees, we had the tenderloin filet, roast duck and turkey, which were all above par, finished off with crepes suzette for dessert. Best meal I’ve had in Thailand. Only drawback was minimal staff for the large crowd in attendance. Thanks for a great Christmas dinner 24th December. Lovely food and a fantastic service. Great to see so many guests. It didn’t come as much of a surprise, but still has to be pointed out: Your Christmas dinner is the best. Yesterday’s meal was a perfect combination of exquisite taste, correctly sized portions and top class service from your great staff. It doesn’t get much better, and the fact that my father was leaving reluctantly after 4 hours at the table says it all. It’s been a while since he spent that many hours in a restaurant. Thank you for providing us with great dining experiences. You’ll see us back soon, very soon ? 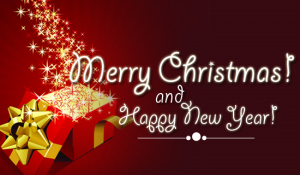 Kim – Pascal and all employees have a merry Christmas and a happy new year. You are the best Restaurant in Pattaya with good food and very good service. See you at the 24th December.Looking forward to 2015 and one new year with good food and good service. Went for a dinner with my boyfriend. We ordered carpaccio and goose liver pate as appetizers, veal and fish fillet as the main course. The food was fantastic! The service was outstanding! Definitely one of the best restaurants in pataya! We ate a very tasty and exquisite food, even refined (we ate both meat and fish). The atmosphere is elegant but not heavy. In any case not recommended to go with children. The staff is very courteous and considerate. The attention to detail is impressive (even in the bathroom). I had a traditional carpaccio a table made tartar and spaghetti Bolognese. All three dishes were very nice. Other customers had table made & flame grilled dishes. In addition the restaurant serves all guests bread, butter, dip and ice as a complement. Great atmosphere for the right money. Every morning, for about 5 days now, I have breakfast there and I gotta say never got disappointed! Location is good, easy to reach by bus, staff is very friendly and the whole restaurant seems pretty clean! The breakfast buffet is pretty good, specially the cooking station! Eggs, ham, chicken, sausage, cheese….you name it! The only thing I miss is a bigger variety of fruits but overall a great place to enjoy your daily breakfast! Located in central Pattaya is easily accessible. The food is European but with some Thai dish too. The presentation is spot on and the quality of ingredients is good. The service is up to the task. Thanks Casa Pascal for the good evening. Very elegant restaurant fine food dining.. Friendly staff. Nice background music and very clean. Easy to park and great location. Food was good and we’ll served. Well what more can one say,I have just returned to my home in Sydney,Australia and im looking forward to returning back to the Casa Pascal in December.I had the pleasure to attend a dinner with 6 of my best friends who were looking to find a good restaurant for a night out.Well they all tried dinner menu from Goose Liver Pate,Pork Knuckle,Oven Roasted Rack Lamb,Tomahawk Steak big and lovely to eat indeed.The Atmosphere on the night was classy and very well organised the staff so professional in there duties.The Day-core inside is so appealing you feel at home when you dine in such a fine restaurant.We arrived at 7pm and left at 3am in the morning. The hole night was perfect my friends enjoyed a special treat on the night with Pascal & Kim the owners enjoying a bottle of Champagne with us all which was offered to us from Pascal himself. To the Casa Pascal looking forward to my return in December also my friends say many thanks to a fine restaurant till next time. Very good 4 course menu. Goose liver on potato cake-then a lovely leek soup. Main course was a lovely gosse. Finally a delightful chocolate mouse with berries. One of the best dinners I’ve had. Waiters did a top job in a packed restaurant. We had an amazing diner with some fresh French oysters and lobster salad. The service was flawless, and the limo service that took us at our hotel was a plus. A must try restaurant if you are in town. I enjoy a morning with friends after a great night out. The buffet selection is good and the food is well cooked. , The restaurant decor is warm and the service staff take good care of you. It is a good value for money. An amazing array of breakfast items to choose from, including, but not limited to, cold cuts with mushrooms in them, roasted potatoes, potatoes rosti, pork and vegetable fried rice, pickled herring, kippered herring, various types of bread, butter, apricot jam, orange juice, pineapple juice, yogurt, omelets, bacon, etc, etc. I just scratched the surface. Regardless of your breakfast preference, you should be able to find something to accommodate your tastes. This is a great restaurant with the most delicious food I ever try before in Pattaya. The price is high in Thai but this value for it. If you want to have a romantic dinner with your lover, this is the best choice. i ve been there for the daily brunch, very nice food on the buffet and bbq and eggs outside. very good bargain with good food for good price. the dining room makes you feel at home, you really don t have the impression to be in a restaurant but more to be invited in someone house it s very nice and cosy, also the fact that the restaurant is not directly on second road keeps you away from the busy streets. I reviewed this place before and it seems to be getting better and better… On a recent visit with some friends I ordered the Schnitzel, which was listed in the menu as “giant breaded Pork Escalope”. They don’t exaggerate! This thing was huge. As big as the plate, which was oversized as well. But not just big, it was juicy, tender, and tasty. Properly pan-fried in butter (and not, as in so many other places deep fried in oil). My appetizer was a smoked trout which I found on their current Trout Special Menu. It was traditionally served with horseradish, capers, and onions. To my delight I also received two amuse bouche (one cold, one hot) as well as a mango sherbet as a palate cleanser in between the appetizer and the main course. As always, the service was friendly, knowledgeable, and attentive. The atmosphere relaxing with just the right volume of music in the background. All in all another great dining experience at one of my favorite restaurants in Pattaya. Casa Pascal will transport you back to European civilization in an instant. Wide variety in brunch (the only time we ever visited). So relaxing compared to the rest of the city and staff are really helpful. Perfect for when you have no idea what you want to eat after a night out. Whether you are hung over or just passing through and do not want a set meal, this buffet is for you. Nice European touch with furniture and quiet with the atmosphere of the Diogenes Club. Genetle rustle of newspapers and fine selection of cuisines from around the globe. Reasonably priced and friendly staff. Lovely fish dinner at Pascal Restaurant. Began with 2 chef’s surprise. Followed by delicious smoked trout. The main course was fresh trout with hollandaise sauce. Best fish dinner I’ve eaten in a long time. Top service from the waiters as usual ,Delightful evening at Pascal Restaurant. Live Canadian lobsters my wife and I had were a rare item and very delicious. A little less sodium in the champaign sauce would have been excellent with all due respect to the chef. Courteous service and excellent atmostphere. I have already written two reviews on Casa Pascal (disclosure there!) but considering how much I enjoyed it during my recent trip I thought I should write a another short review.I dined here 4 or 5 times over a 10 day period and while not everything was perfect (that is unfortunately a possibility anywhere let alone Thailand) I still thoroughly enjoyed every visit. The staff are fantastic and they deserve alot of credit. And that includes the kitchen staff who are cooking a very wide variety of dishes and are no doubt kept on their toes with the frequent specials and gourmet dinners that change all the time. But for me the absolute highlight was my last night (fittingly) where I ordered on a Friday night the live Canadian lobster simply ‘grilled’. This was hands down one of the best meals I have had, it was cooked to perfection and was a perfect serving of lobster in terms of the quantity of meat. It was butterflied and simply grilled (on a high heat) but not overcooked at all (befitting something that was as fresh as you can possibly get).The head waiter was very patient and helpful in describing the different options for the lobster, and I am glad I chose the most simple cooking style because why on earth would somebody want to smother something this good in a ‘madras sauce’ or one of the other five options? Great value for money (but don’t put up the price just because I said that!) at 850 baht for a whole live lobster (granted its not a huge lobster but its a serving for one person and I was very full). Where else can can get that in Thailand let alone in this comfort? My best dining experiance in Pattaya! Very friendly staff, outstanding service and perfect food. Personal attention of the chef. Had a good after dinner cognac and a cigar from their collection. Hardly to find nowadays in a great ambiance. The food is very good and was amazed that they got such a big varieties for both food and drinks, if you don’t want to think, they got sets for both lunch and dinner, just 1200-1500 Bht. For the dinner set which got a four – five course with drinks. Tried the special “Hunting season dish” with Quail, cooked just perfect. Service is a major plus :(i) very quick responds for online bookings; (ii) most of the staffs are good in English; (iii) the boss managed very well and will greet around each table for comments, the best is they offer FREE pick up and drop down service which made us feel like VIPs. Will definitely return when visit Pattaya again. Excellent food, Attentive staff, good wine. Nice touches for my partners birthday. What else can I say? Brilliant night out. Little gem in Pattaya. I never found good western restaurants outside Bkk but Casa pascal is an exception. Authentic and delicious. I have eaten in Casa Pascal several times and I have never been disappointed. There is an excellent choice, the service is exemplary and the ambience is perfect, all of which adds up to a great dining experience. ,I will continue visiting Casa Pascal and will continue recommending it to friends and family. Definitely not a place for lovers of fast food. I took the set menu with unlimited wine: everything cooked to perfection with unexpected extra courses. One of the few places left which provide napkins with button-holes. Fine dining with attentive service. The staff are extremely friendly here and speak very good english (which is sometimes hard to come by in Pattaya). I enjoy attending the breakfast with a large groups of friends. The breakfast buffet is daily and has lots of variety,The bbq/egg station area outside is a great idea. You can choose your meat or eggs and watch them being cooked in front of you, and lets face it we all love meat of a bbq!!! Inside offers a wide variety of fresh bread, salad, vegetables, beans and potatoes. The only down side is the selection of cheese, there is only ever 1 type of cheese and it goes very quickly!! However how can you complain when this breakfast deal is 210b and a great start to the day!! On the evening the service is again outstanding and the food is cooked to perfection, many people stating that its the best steak in Pattaya. Definitely worth the money. Ideally located on 2nd road opposite Dicey Rileys/Royal Garden. Very good breakfast buffet. Very good bread. Egg & steak station outside. Many things to choose: eggs, ham, bacon, sausages, chicken, pork and cooked in front of you. Always a very good start to my day. Fantastic restaurant. Absolutely faboules Food and service was par exelant…..
Our best restaurant experiance ever. New excellent dinner at Pascal Restaurant. The chef come with 2 surprise before the starter. One cold and one warm. Lovely both. I start my menu with Italian seafood soup with saffron. Then i had lam rack for main course. One of the best meal I had for long time. Top service from the staff like usual. Kim Snyder runs a very fine operation. The restaurant is central, has plenty of car parking and is, generally, within walking distance of most central hotels. No doubt his cuisine is French, but he has variations at all levels which cater for most people’s taste. It is sophisticated and it is quality. For those wanting ‘that little bit extra’, then this is the place for you. Highly recommended. Best restaurant in Pattaya ! Exceptional service! Great French and Thai cuisine! Great romantic atmosphere! Nice bathroom! Over the fourteen years we have visited this restaurant many times. We really like this restaurant. The food is more than great and the service is unbelivable good! This time I did have Foie Gras as a starter and followed up with duck as a main course. It was so tasty! It was all served by a very efficient staff. They were always there when you needed something! Complementary I got free appetisers. This was great! Great buffet with a nice choice from fresh bread and cheeses, cereals, fruit, waffles, pancakes and croissants right through to eggs bacon, chicken cooked how you like. Too many things to mention. Also tea, coffee fruit juices and soft drinks included. If you really enjoy brunch, you need to try this place! What a great value, too! Eggs and Omelets cooked just how you request them, fresh breads and croissants, a small, but very good choice of foods on their buffet. Inside seating with air conditioning, outside seating available. The freshly made waffles and pancakes are great, along with the fresh coffee. Visited two times for dinner during recent holiday in Pattaya. Central location on Second Road, across from Marriott hotel. A warm welcome, smoking and non smoking table well separated. Extensive menu, with French majority of dishes, but also a Thai menu. Always attentive, correct waiters, but they can also make a joke if you invite to it. One of my favorite dinner choices in Pattaya. However, the breakfast is more average. I have traveled the world and am so happy to have found this AMAZING restaurant! I was a little concerned finding a great place to dine in Pattaya…. and am happily surprised! One of the best dining experiences I have had….. The food was fabulous…. served by really great staff! Thank you for a great dining experience! If you’re into food, this is the place. I’m on a bit of a mission to get round the fine dining circuit of Pattaya, glad I made a stop here. Excellent food and service for twent y participants. There a great atof the best addresses in Pattaya. I am a regular at this restaurant for breakfast and I think it is one of the best value for money places in Thailand. So the juice is not freshly squeezed, do you really expect it to be at the price you are charged for? There is a large selection of fresh fruit, hot beverages, salads, cold meats and smoked fish. The grill cooks eggs, any way you wish, there is also bacon, pork and chicken, and you can eat as much as you like. I will say it again, this is the best Value for money place to eat in Pattaya, if not Thailand. I’ve been there only once, but the scallops in lobster sauce were some of the best scallops I’ve ever had. The were cooked to perfection. My partner had duck breast with applesauce and raved about it. The side dishes for both of us were also very good. Plus the drink pours were not stingy and not overpriced. Overall, it’s not the least expensive restaurant in town, but value for money can’t be beat. And lastly, the service is warm and friendly. Opposite the Marriott Hotel in Pattaya you will find Casa Pascal. It sits in front of Ruen Thai Restaurant; Make sure you reserve your table. This excellent restaurant guarantees not only the finest food, wines, service and variety but provides meals of such proportion that when we had finished our first course we wondered how we would handle the main course! This is an exceptional restaurant not to be missed by those who enjoy a superb meal in luxurious and restful surroundings. From the beginning the entrance till we were gone: Everything was perfect. The services are very kind and friendly. Their English is very good; especially I saw one of those services speaks many languages. I had the smoke salmon as a starter, which they smoked themselves. It is the best smoke salmon ever. The really big Wiener schnitzel as main course, it was larger than the plate, very nice. My wife had lobster soup with port wine; she still wants to return back there only for the soup. And the main she took the salt crusted Thai sea bass, they make the filet at your table, very professional, the fish in this way nowherelse could do it better. For a non-sugar free dish we shared 1 crepes Suzettes, which they flamed it in front of our table, wow it was fantastic….thank you for the great evening at your home Pascal. It is really welcome…see you soon again. Five of us-friends-recently visited Pattaya for our holidays. One of us heard about this restaurant as MUST GO PLACE for dining in Pattaya. Therefore, we tried one evening for dinner. Dining place is very cozy and warm atmosphere with stylish set up. Staffs were very friendly and helpful for menu choice. All of us had different appetizers and main dishes just to try all the dishes as much as possible (Sorry to the kitchen, they might dislike us!!! )Surprisingly, all of us were served each dish at same time same as for the main dishes. All the food tasted succulent! Congratulations to the Chef. Another very thoughtful touch is in their restroom. Best place in Pattaya. All of us were very impressed with this nice and beautiful restaurant and each of us wishes to visit Casa Pascal again with family or loved one next time. Casa Pascal is the restaurant with our surprise. We did not know this restaurant before. It was just by chance we found this beautiful cozy restaurant.. Very warm and stylish deco leads us to the restaurant on the way our dining place hunting. Friendly staff welcomed us at the entrance and guides us to the table which is set up with high standard of tableware. Impressive! Set menu and promotion menus sounded great and a-la-carte menus are very comprehensive. Especially when you see the price, you feel to try all of those dishes. We had a great evening at Casa Pascal and soon we want to try their popular Breakfast while we are staying in Pattaya. Casa Pascal! Keep as you are. Great job. I and two friends dined at Casa Pascal to celebrate my birthday. I dine here nearly every time that I visit Pattaya. I always find the restaurant’s atmosphere relaxing. Somewhat of an oasis in the busy city of Pattaya. All of our meals were excellent – from the succulent rack of lamb, to the salted sea bass, and the crispy and juicy pork knuckle. A very nice bottle of Santa Ana Malbec complemented our meal. The assortment of freshly baked breads was a treat. And, our wait staff was most friendly and congenial. All in all, a most enjoyable dining experience. What can one say about the Casa Pascal, well there is plenty to say. I have been going to Pattaya for well over 25 years and love all the changes about Pattaya and the fine dining in and around pattaya.Many places have failed to come to fine dining or the so called cheap Breakfast around the town. Of course all travelers want cheap food for a cheap price and expect high quality food for what they pay for well its not the case and I have travelled the world let me tell all you so called experts on food go back to your own country and see if you get better food for the price you pay in pattaya it will be a big fat NO.I find casa Pascal the high light of my holiday fine staff, clean and tidy, food to die for weather it be for Brunch, Dinner, and the quick morning breakfast found the food to be well presented cooked to my liking.The Chef at the BBQ area does a fine job my food was always cooked to perfection and quick at hand. There is many different delights inside around the front table near the kitchen lovely assortment of Breads, juices freshly made on the premisses a delight to have sweets to die for. The staff are always on hand to keep the breakfast up to speed. Its very clean at the Casa Pascal which I look at all the time. Many other places I have eaten at I have been sick that is due to unclean areas very un hygienic. To the Tourists of Pattaya visit Casa Pascal not just for Breakfast try the Brunch, Dinner you will enjoy fine food at the right price. Casa Pascal’s Dinner delights on every level. I had a ball of the softest ghose liver parfait you have ever eaten, with a subtle zing of citrus to its gel peel. This one item – it is barely a dish – is destined to become a culinary icon for sure. Others will copy it – they shouldn’t. Another starter brings scallops, seared only on one side with cucumber ketchup. What makes the dishes sing is a pitch-perfect acidity, a mark of almost all the saucing here. The main course was a Canadian live lobster and I still wanted to lick the plate clean of its delicious cafe de paris butter sauce. All in all there was an excellent service with great attention to every detail. Dinner by Casa Pascal may be not cheap, but it’s also bloody lovely. Save up. A lovely evening at Pascal Restaurant. Began with a very good goulash soup. Followed by one of the best fish dishes I’ve eaten Dover Sole. Top service from the waiters and the owners Kim and Pascal. Using Trip advisor we found this restaurant which we may not have otherwise found. From the start we had a great welcome and excellent service continued from there. We had the lobster thermidor and a dory fillet both of which were of high quality, so much so we have reserved a table for our last night stay. Thank you Casa Pascal. The breakfast buffet is the best value in town, especially considering the eggs and steaks are cooked to order. Not to mention the best selection of bread, croissants desserts and drinks that I know of – all for 200 baht! Then when I have a special occasion I visit in the evening, this is just superb! Five course meals with unlimited wine for under 2000 baht – as well as service that would not be out of place in any 5 star restaurants. If you go once, I guarantee you will return! This is just great. We have been visiting Casa Pascal since it opened many years ago. Khun Pascal and his wife has made this restaurant to one of the best in the busy city of Pattaya. The interior is very tastefull. The food is excellent, this is really a gourmet restaurant! I will not mention any dish in particular, they are all very good, at least the dishes we have tried. In the older times, they did have a set gourmet-meny, which was fantastic! They served up to eight dishes to a very reasonable price. Last time we were there, we did not see the special meny anymore, but we did not have any problems composing our own gourmet dinner.The service is what you expect at a first class restaurant, brilliant! We have also tried the brunch several times, nice food at a very reasonable price. They have both outside and inside seating. For the brunch it is very nice to sit outside. The location along the second road, near Royal Garden, is easy to find. last night I went back to my favorite Restaurant Casa Pascal. Me and my colleague we have had a very delicious 2 course menu with Foie Gras, first as the best ever Terrine and second hot on a small roesti. Sooo delicious and Chef Mr. Pascal ask if we would like to have a 3rd as Carpaccio. Sure we take too. He recommends us a sweet sparkling from Canada which was a great surprise as we never tried something like this. It match perfect with the Fois Gras. Thank you Mr. Pascal, we come back for sure. Unlimited American BF with cornflakes,eggs,fruit juices,sweet dishes,fresh fruits top it all remains open from 8-00AM till 2-0PM for BFTea,coffee,toast breads etc many many items to choose even for Vegetarian like me. Even the restaurant was full we got excellent service. On the 25th they offered Christmas menue which was just fantastic. Also the selection of wine is good. On our next trip to Thailand we will vist Casa Pascal again. I read much about Casa Pascal’s breakfast buffet here and finally made it to it today. Even with my high expectations, I wasn’t disappointed. Rather the opposite. What a great deal! The bread station alone is worth a visit (the croissants are top-notch) and the grill on the patio prepared my eggs just the way I like them: sunny side up and still a bit runny with plenty of meats to choose from. The cold cuts and cheese is fabulous as are the hot dishes. But what put me into food heaven was the dessert tower. Spectacular! I can only recommend this buffet for anybody who’s looking for not just a good value, but high quality as well. I surely will be back soon. Fine dining in Pattaya? Yes it exists here. Food is exquisite, service professional and attentive. The owners Pascal and Kim are great hosts. Try the freshly shucked French oysters…to die for! We also had pork knuckle and beef tenderloin. All perfectly cooked. Its pricey but you know that when you choose one of the best in dining experience. Well done and thanks guys. I went to Casa Pascal with a friend from Switzerland who knows this restaurant already. I was not disappointed and I was quite impressed either by the quality of food or the quality of the service. Casa Pascal is a really nice restaurant and I would recommend it to anyone who looks for a nice-classy restaurant with awesome dishes. I have to go back to taste the desserts!!! I was full after a starter (scallops) and the main course (lobster thermidor). if you want to celebrate any special occasions or for any reasons…don’t hesitate to book a table! Top service from the waiters as usual. Delightful evening at Pascal Restaurant. Thank you again for the lovely evening. Me & Maem we felt like we are in paradise. Your friendship together with the brilliant & delicious dishes created a perfect moment for us. Let’s repeat that from time to time. As for the ‘Eglis’ I’m not so sure if you can beat my mother’s recipe ? From the bottom of my heart: thank you so much for your hospitality yesterday. It was one of the most exquisite meals I’ve had in a very long time. Your risotto was out of this world and the ossobucco, despite your challenges in procuring it, a real culinary delight. In fact, I was so excited to see that you didn’t strain the sauce as I have seen done in other places. This dish could easily compete with the one my Italian grandmother from the Po region used to cook. And the Polenta was a real Leckerbissen as well. Creamy and tasty…and presented in a way that I have never seen before. The entire meal was a feast for my senses. The only thing I regret is that I was so stuffed at the end, I didn’t even know where to put the wonderful Zuger Kirschtorte. You’re my gastro-hero in Pattaya…hands down! Belated thanks for organising such an impressive meal for us the other evening. Ian enjoyed his birthday immensely thanks to the professionalism that you and your staff showed once again. Your own personal crockery and cutlery added a special touch to the whole evening. I stayed for two weeks and visited 5 times I think. I really enjoyed each trip. In fact your email reminded me to post another review which I have just done under ‘TheFussyDiner’ which of course was a 5 star review on Tripadvisor. It should be posted within 24hrs. I really thought the food was excellent on my last trip and it really made my holiday. I went to Matahari just once, and its the same old food but prices are now noticeably much more expensive than Casa Pascal, especially after your price reductions. I went to Brunos and the food was ok, but the staff looked like they wanted to kill themselves! Dont even get me started about Manhattans… now Bart has left it has really gone to the dogs. Thank you for your e-mail and your kind concern for Stefan. I got him some Erfuzide capsules and they have worked wonders, he is almost back to his usual, bubbly self. As you say, Thai food can be very deceptive. My stomach and immune system is pretty well hardened now but he is still vulnerable. We had a great time at your restaurant Paschal and enjoyed the food immensely. Thank you to Kim and yourself for making us so welcome. I am trying to extend our trip here by an extra day or so and if that happens we will be back to dine with you again. Thank you so much for your very kind invitation. Unfotunatly I won’t be able to take part because I am in Denmark visiting my daughter. You have always been great supporters of PILC and our members always enjoy the coffee mornings and lunchons in your restaurant. I would very much like if another representativ from PILC could be present celebrating your anniversary and will ask the Vicepresident Joyce if she can take part of the dinner if that is okay with you? In May 2012 we had a fabulous birthday party in your restaurant. We will be in Pattaya and we would like to book again for dinner on Monday March 11, 2013 for 12 people non-smoking. I will confirm when we arrive in Pattaya from Australia. Looking forward to seeing you again. Hi.. the evening was perfect. Many thanks to you and all the team. The food service and whole operation was fantastic. I will be putting something in the magazine as well…I will be recommending your service! Many thanks for making my wife’s birthday a huge success. Merry Christmas to you and your team too kha ? your food was very delicious yesterday!! Thanks so much for such a good food!! Thanks for this year.Many good dinners. Thanks for the lovely evening yesterday, perfectly organized. Thank you very much for service of our dinner on Tuesday. We are impress your restaurant , food, service and all of your set up for us. Thak you for your beautiful pictures.And I enjoyed your restaurant so much. I am sure your place is the best in Pattaya. Dishes were excellent and I was impressed the restroom was so beautiful. from you all,we”re appreciated . the atmosphere and your staff. We ‘re just arrived home in BKK. Pascal Restaurant. I will visit you again on my next trip to Thailand. Edwige (expat 2005-2008 and ex member of PILC). Thanks for your arrangement. All of us also enjoy the dinner and satisfied at Casa Pascal. well, I would like to thank both of you for your kind – legendary – hospitality, the excellent lucullic food and the nice company. We are happy to count you as our friends and hope that the rest of the year continues in such a nice way you started it for us. Hope it get the same in 2012. Once again, many thanks for your hospitality last week – it was great to be back @ Casa Pascal! Thank you for making yesterday’s celebration a success. Food as well as attention from your staff was first rate, and everybody enjoyed the evening. We have been gathering the family around the fondue table annually for more than 40 years at different locations around the world, and yesterday’s event will certainly go into history as one of the memorable ones. The only complaint was from one of the youngest: She was given two scoops of ice-cream even though she only wanted to eat one! I think we can live with that ? Thank you very much, you and your team did a great job for the birthday dinner of Mrs. Achilles. And thank you from Som and myself for your hospitality. I want to thank you for your very generous hospitality last Saturday night. It was a very kind gesture by both of you and I enjoyed myself enormously. I will miss you both so much my very dear friends. Today I had the pleasure of enjoying your Sunday Brunch. I arrived at 10 and was alone for a while. I guess Pattayans are not early risers. I have so many things to compliment you on your wonderful brunch. I am sure I have left something out but there were so many delicious and inventive dishes: fois gras d’oie, crème de fois de vollai, all of the fish dishes, the mussels were especially fine, and the clams, and the coquille St Jacques, and I couldn’t try everything. Anyway Bravo! Oh yes the mousse de chocolate! I will be back in Pattaya in February on my way back to Chiang Rai. I will do my best to try again. Thank you again for a marvelous morning. It was another great meal after few years ago meeting you here in your restaurant, trust that you don’t remember me, I used to work in Grand Hyatt Hong Kong and certainly we both know chef Budde. The meal tonight was just excellent, same as my last visit, though I don’t come often, but definitely think of you, many thanks for your staff’s hospitality, they are well trained and just great in service, the best in Pattaya, may be in Thai? Thank you and look forward to visit you again, may be tomorrow? Most likely! Very many thanks to all the staff at Casa Pascal during our 2 visits to your restaurant on our stay in Pattaya. We eat one evening and then booked a lunch time party for our two friends. Everything was excellent and very well arranged. Special thanks to Hasli and Yok who looked after us so well for the party. We will definitely be back to see you on our next visit to Pattaya some time between January and March. Greetings from Mercure Chiang Mai! On behalf of the Mercure Chiang Mai I would like to express my sincerest thanks for your support during the Swiss night event of last week. It was a great success and I only received good guest comments. Thanks to your effort in creating, organizing and executing the Swiss dishes, the event was a culinary unforgettable treat not only for our guests, but also for myself (of course) and Mr. Pichler, who only had praise for your cooking skills. Thank you once again for your support and I do hope, even though you haven’t get any remunerations, that you have also enjoyed your short trip to the north! THANK YOU SO MUCH for your good arrangement. My wife and I really appreciated your excellent services. I recently spent a week in Jomtien and returned to eat at Poseidon where I had dined during earlier visits to Thailand. I was so happy with the food and the service last week at Poseidon that I returned daily for both breakfast and dinner throughout my stay. I write to compliment you on the professional staff who are indeed responsible for my frequent return to the restaurant. I was always greeted by name. The service was always attentive, never intrusive. Staff made appropriate suggestions when I was uncertain about menu options. And when I wanted a little conversation, staff were friendly, congenial and simply fun to be around. Poseidon will always be my restaurant during subsequent visits. Thank you for a fine menu with beautiful presentation; most importantly, however, I commend you on your fine staff. Please let them know of my appreciation for their kindness and their friendship during my visit. You provided great food for the wedding and I have told many people how good it was. Even mentioned it in my report of the wedding which you can find on page 61 of this week’s Pattaya People. My friend and I have been back to HK, it was such a great trip and we really enjoyed the dinner at your restaurant! On the occassion of Ingo’s Birthday you both were quite magnifiecient hosts; your food was outstanding and the service staff brilliant. To top it all you have send out an album of photos which shows off the fun all, every single guest of Ingo’s had. thank you for making this a very special party! the food was just outstanding. As to wine I think you found the never ending bottle…..it was bottomless and possibly priceless and what good wines! On behalf of the Birthday Party yesterday I would like to thank you and your staff for a fantastic evening. I hope you can share with your staff that the 14 guests agree to that Food Quality and Service was outstanding. Your restaurants got a few extra admirer and customers who would like to come back to you next time they are in Pattaya. Thanks a million! I’m looking forward to my next visit to Casa Pascal!